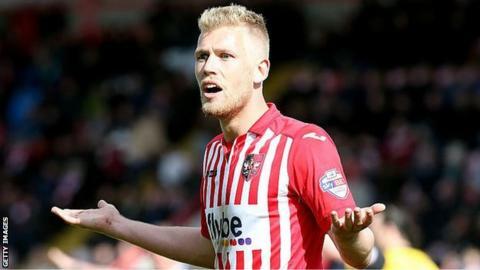 Aberdeen have signed Bournemouth's Jayden Stockley on a pre-contract deal. The 22-year-old striker has been on loan at English League Two side Exeter City since January, where he has scored 10 goals in 22 appearances. Exeter boss Paul Tisdale twice offered Stockley a permanent deal, but he has opted instead for the Scottish Premiership. Stockley told the Aberdeen website the chance to play in Europe was "a big part" of his decision to join the Dons. He spent the first part of this season on loan at Portsmouth, scoring twice in 12 appearances. He made his Bournemouth debut as a 16-year-old in 2009, but last played for the club when they were in League One in March 2012. He spent much of the following season on loan in the Conference with Woking before spells in Leagues One and Two with Leyton Orient, Portsmouth, Torquay United, Luton Town, Cambridge United and Accrington. Aberdeen will finish second to Celtic in the Premiership, and Dons manager Derek McInnes was keen to sign players soon with the Europa League qualifiers beginning on 30 June.